Genesis Generations Lost (USA/Europe) in 07:45.53 by maTO. 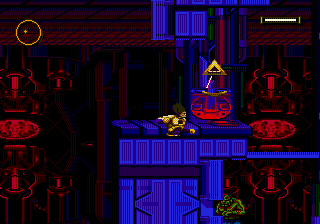 Generations Lost is an action-platformer developed for the Sega Genesis by Pacific Softscape and released by Time Warner Interactive in 1994. The player takes on the role of a young adventurous man named Monobe who is searching for the past of his people. He is equipped with an arm-mounted device called an "e-rad" and what is believed to be magic armor. These devices allow Monobe to project energy bolts and create energy ropes to swing on, in addition to basic fighting skills, running, jumping, and rolling. The player must use his skills and his devices to traverse the many strange lands of the game. In this run, maTO runs, jumps, rolls, and swings his way throughout the world to find the mysterious past of his people.